All quick service restaurants are not created equally. "Fast casual" is the latest concept in this type of restaurant dining. The term comes from the concept's hybrid nature—it's a blend of fast food dining and casual dining. Let's explore all the concepts. The actual industry term for a fast food establishment is "quick service restaurant" or QSR. It's most easily understood by thinking of such dining concepts as McDonald's, KFC, and Burger King. Fast food/QSRs have price points of approximately $4 to $7 per meal, with pizza chains typically running just a bit more. That said, the competitive nature of fast food dining has promoted chains like McDonald's to periodically slash prices by up to 15 percent for its Happy Meal option bringing prices down to $1 to $3. These restaurants have average food, offer limited menus, and rarely provide table service. The top six fast food restaurants in the U.S. (ranked by size) are Subway; McDonald's; Starbucks; KFC; Burger King; Domino's Pizza, and Pizza Hut. The fare at these QSRs is primarily hand-held sandwiches, wraps, burritos, and a limited selection of salads. McDonald's McCafe has added upscale coffee drinks such as McCafe Mocha, McCafe Latte, and McCafe Mocha Frappe, which are becoming an important and growing component of the chain. The menus are limited, and usually, the food is available for take away, though seating may be provided. The ambiance is essentially functional—lots of plastic seating and table tops, fluorescent lighting, and the chain's branded graphics. This is changing somewhat as McDonald's converts some units over to a "softer" interior design. The fast-food universe is an interesting one. Every day, millions of customers walk into outposts of fast food chains all across the globe, place their order, and walk away with exact copies of the same dish folks are eating at (almost) every other location, all of which are assembled in the blink of an eye. However, there's a growing trend toward upscale fast food because far too many fast food chains effectively copied each other and ended up creating a bevy of look-alikes. Today, there's an upscale fast food niche (most accurately identifiable by the Pret A Manger chain) on the scene. Although sandwich shops are technically QSRs, Pret A Manger offers healthier-for-you food in appropriate portions–and gets consumers out of the store in about one minute. Casual dining is best described by concepts such as TGI Fridays, Applebee's, and Chili's. The industry leaders include Applebee's; TGI Friday's; Buffalo Wild Wings; Chili's Grill & Bar; Olive Garden, and Outback Steakhouse. Casual dining has price points of approximately $15 per meal and offers menus with a much wider range of choices and QSRs. If you look at the Applebee's menu, you'll see that items go well beyond the limited QSR hand-held foods. They include more extensive beef, fish and poultry options, as well as an extensive line of salads. Additionally, most casual dining restaurants serve alcohol. Ambiance varies considerably, but the quality of the interior, walls, floors, ceilings, tables, and seating are more appealing than QSR standards. Many casual dining establishments like Applebee's have a lot of wood and millwork, custom lighting, and over-sized booths combined with tables and chairs made of similar upscale materials. In short, it feels less like a cafeteria and more like a restaurant. Fast casual borrows a little from fast food and a little from casual dining. Fast casual industry leaders include Panera Bread; Five Guys Burger and Fries; Jimmy Johns Gourmet Sandwich Shop; Chipotle, Mexican Grill, and Pizza Restaurant. 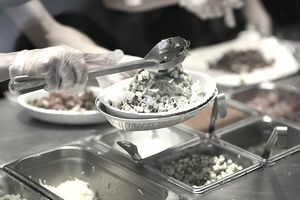 Fast casual establishments feature a more upscale and diverse menu selection, as can be seen at Chipotle Mexican Grill. Over at Panera Bread, basic sandwiches are replaced with Signature Hot Panini, like the Cuban Chicken and Tomato, Mozzarella and Fresh Basil. All sandwiches are made with artisan pieces of bread, not the white loaf bread or soggy rolls found elsewhere. Also, salads are hand-tossed and not pre-packaged. Fast casual typically has no table service; orders are placed and paid for, and customers are then directed to an assembly area where their food is ready and waiting for them to take to a table. Some chains use a slight variant—they will take your order, let you proceed to your table, and a food runner will bring your meal to you. The ambiance is more upscale compared to fast food, with soothing interior designs ranging from soft pastel colors to fireplaces. The look at most Panera Bread locations goes all the way to the other extreme from the industrial, brick and stainless steel look at Chipotle—dubbed the "Chipotle Experience." The fast casual niche is booming. According to Technavio, the market for fast casual fare is expected to hit $66.87 billion by 2020.